1. Why did the government shutdown? "Congress has one key duty in the Constitution -- pass spending bills that fund the government. 2. But why couldn't Congress pass a spending bill? 3. Has the government shutdown before? 4. Then why are people saying it's the second shutdown in modern history? "Prior to 1980, everything kept on running pretty normally during budget impasses. True shutdowns didn't happen until after a series of Justice Department rulings at the tail end of the Carter administration. Since then, there have been a handful of shutdowns prompted by garden variety disagreements over funding levels for defense and domestic programs, but they've been so brief as to be barely noticeable. 5. What is a furlough? 6. 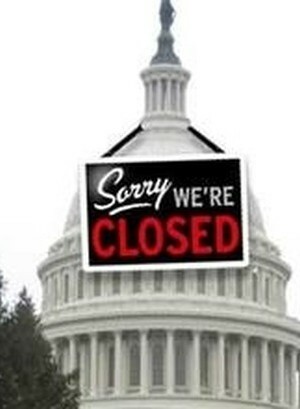 How many people are furloughed? 7. Well that's no fun. Who exactly isn't working? Check out this chart compiled and regularly updated by The Washington Post on each department's impact and contingency plans. During this shutdown, over 400 national parks are closed, the National Institutes of Health can no longer answer its medical hotline, the Justice department has suspended many civil cases, companies can't check the legal status of their employees with E-Verify, and the Gateway National Recreation Area in Sandy Hook, NJ had to furlough their poison ivy-eating goats. Other interesting furloughed workers include aviation safety inspectors, food inspectors and auto recall inspectors (so many inspectors). 8. Is the whole government shut down? "No. There are three big categories that don’t. Some programs don’t require annual appropriations. 9. I'm so confused. Can you make this more simple? "There are two types of mommies and daddies who work for the federal government and might be affected by the shutdown: non-essential and essential workers. 10. How long will the shutdown last? 11. What will this do to the economy? How do you feel about the shutdown? Who is to blame? How much longer until there is a congressional compromise? Let us know your thoughts!